Chromat, founded in 2010 by Becca McCharen-Tran, singularly champions inclusivity since its inception. Co-created with architecture student Emily Kappes, the brand was nominated for the CFDA/Vogue Fashion Fund in 2015. Their work has been worn by every popular female musician—Beyonce, Taylor Swift, Madonna, Nicki Minaj, Ariana Grande, and more have been seen in the label’s body-con outfits. This diverse group of women symbolise the significant effect the label has had on popular culture. What’s even more important about inclusivity at Chromat is that they specialise in swimwear, a division of the fashion industry that famously celebrates the slim sun-kissed bodies. Their Fall 2017 collection was characterised by notions of protection. 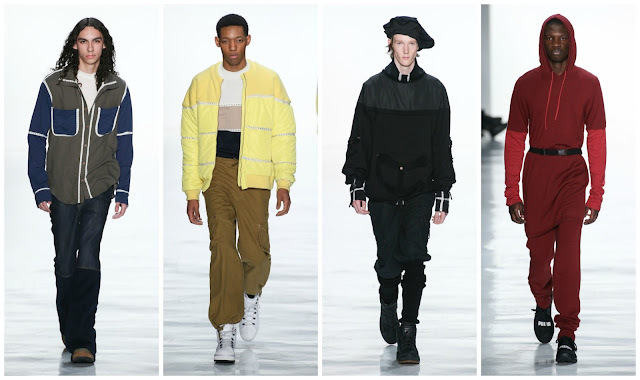 The designers employed their architecture expertise and deconstructed puffer jackets into concertina-like skirts and bandeaus and lifejackets, dresses and wide-sleeved coats. There were militaristic flairs to the subdued army-green hues and shapes. The theme of protection and armour has run through fashion for a number of seasons as we endure turbulent times, socially, politically, economically. It’s a poetic reflection of society; Chromat characterise their poetry with lightness and sensuality, channelled through their base: swimwear. The beauty standards of the fashion industry are narrow. Models aren’t representative of the wider world; some are skeletally thin. This isn’t to demonise those women, but to highlight that there are—shock horror—other shapes and sizes. Chromat celebrates that. Men, women; big, small were encompassed in this multiracial casting, which skewered many ethnicities. It was a microcosm of America—a melting pot of race, built by immigrants. However, we all know this isn’t placed on the pedestal anymore with increased exacerbated racial tensions. Telfar Clemens is a designer who ensures there is diversity on his runway. Speaking with Vice, on the eve of the brand’s tenth anniversary in 2015, he was asked about the issue. “It’s purposeful in the way that fashion is for everybody. I hate it that there are dynamics that goes against that in a weird way. Being diverse is the future. It is also representative of what the brand is.” If that doesn’t capture the industry’s relationship with diversity I don’t know what is. There is a lack of opportunity for minorities in the industry—casting a glance at the collections and the designers behind them would evince that. Deconstruction is the word for Clemens. He preys upon the banality that dominated his childhood. He deconstruct shirts, sweaters, jeans and pieces them back together, but with blue sleeves on the olive shirt or indigo jeans on dark wash jeans. The heightened banality doesn’t just stop with reappropriated denim. There are added pockets for added functionality and stylistic surface decoration. While all clothes should be considered unisex—whoever wants to wear them should wear them—the insistence of a unisex label is important today. Telfar is self-defined as a unisex label. Think of President Donald Trump reportedly asking the men who work for him to be “sharply dressed” and for women to “be dressed like women”. The concept of being dressed like a woman is hilariously idiotic seeing as that isn’t up to Donald Trump, it’s defined by the individual. Clemens unisex clothes are presented mostly on men, some androgynous, but have the loosely and sometimes tightness that lends itself to the traditional notions of dressing but as I said—whoever wants to wear them should wear them. The defiance in Chromat and Telfar has been here since before the Trump presidency and isn’t pointedly referencing that. It comments on society as a whole: the way it collectively demonises body types and skin colours, the way it forgets them. McCharen-Tran and Clemens are two designers without whom the New York schedule would be far less influential. The wider fashion press hasn’t provided sufficient support or emphasis on these two brands but their very existence is symbolic of change. People who don’t conform to societal ideals have labels to turn to.